Binational forum: In Defense of the Desert and its Water. No Fracking. Chihuahua versus Fracking, the Mexican Alliance Against Fracking and the Heinrich Böll Foundation invite the public to a forum where specialists will share scientific information about the consequences of this technology, and organizations and communities affected by fracking and/or the presence of gas ducts on their land will share their personal testimonies. Hydraulic fracturing or fracking is a technique used to extract hydrocarbons that requires the injection of 9,000,000 to 29,000,000 liters of water for each well that is drilled. The water is mixed with sand and anywhere from 650 to 990 chemical substances, many of which are toxic and can cause serious health problems. Leakage of water contaminated with chemicals, oil and gas, together with the release of other toxic substances present in the ground pose serious risks to air, soil and water quality at all stages of the fracking process. Waste water is either stored in open-air “transfer ponds” where the toxic substances evaporate or it is injected into waste wells where the large volumes of wastewater can create earthquakes. Fracking is also responsible for the release of high levels of gases and other dangerous substances into the atmosphere, including methane gas which affects global warming much more than carbon dioxide. In Mexico fracking has already taken place in the states of Veracruz, Tamaulipas, Nuevo León, Puebla, Tabasco and Coahuila. In the near future, the states of Chihuahua, San Luis Potosi, Hidalgo and Oaxaca could also be affected by the implementation of fracking, which will have irreversible environmental, social, and economic consequences. The extensive use and contamination of clean water is of particular concern to us. to strengthen and articulate popular resistance struggles against fracking as well as other struggles against natural resource megaprojects. Please join us. Simultaneous translation will be provided. from 7 to 10 pm. Local de la Sección 42 del SNTE. 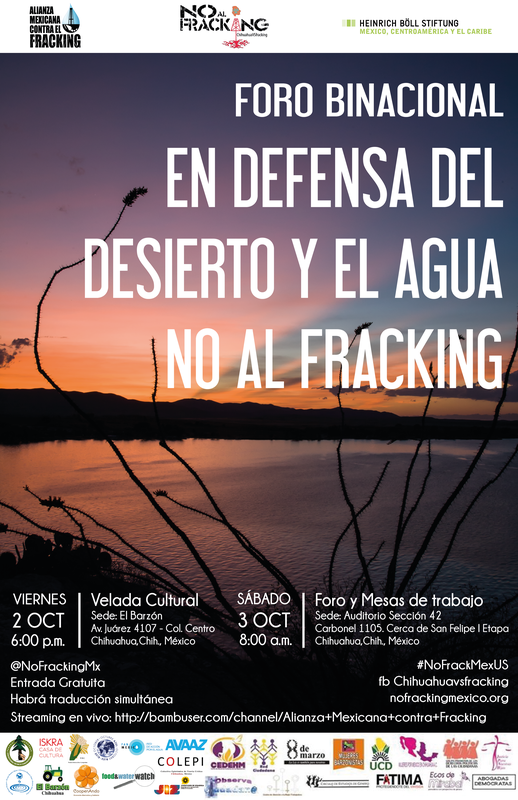 Impacts of Fracking in Papantla,Veracruz, Rodolfo Bibiano, inhabitant of Papantla. Each work group will have a facilitator and one or two people to generate discussion and debate. The discussion will center on previously formulated questions. 4:45 Plenary – The relevant information from each group will be shared with attendees. 5:45 – 7:00 Final Comments.